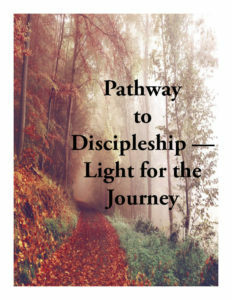 Our Spiritual Journey Together is a pamphlet that briefly introduces God’s plan of salvation. 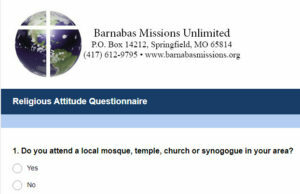 The pamphlet was designed as a companion to be shared with people who answer positively to question #8 of the Religious Attitude Questionnaire (“May I briefly share with you what the Bible says about God and the spiritual realities of life and death”). The first panel, or the front, depicts God’s hands and a man and woman that he created. 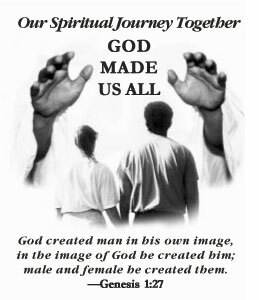 The Scripture passage is from Genesis 1:27 NIV: So God created man in his own image, in the image of God he created him; male and female he created them. The verse is from the beginning of the Bible – God’s Word to us. It affirms that the salvation story starts at the very beginning of human history. It reminds us that God created everyone—an idea that no reasonable person will argue with. We are all God’s people created in His image and thus have extraordinary worth to Him. We are all in this together as part of the family of God. Yet, everyone needs salvation. The second panel, on the inside, depicts diverse people (of various ethnicities and cultural backgrounds remember, salvation is for everyone!) going their own direction, and God’s hands held up in alarm. 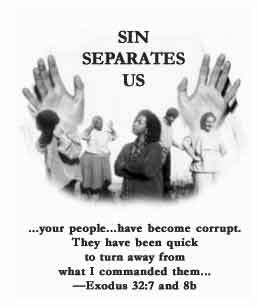 The Scripture is from Exodus 32:7-8 NIV: …Your people …have become corrupt. They have been quick to turn away from what I commanded them…. Here’s some background behind the verse. At this point in the Exodus story, God has freed the people of Israel from slavery, taken them to Sinai, and Moses is on the way to receive the Ten Commandments. Have you seen the movie The Ten Commandments? Most have in some form. God continually refers to Israel as my people up to this point in his instructions to Moses, but in chapter 32 of Exodus, the people of Israel, certain that Moses is dead on the fiery mountain, convince Aaron to make a golden calf they can worship. Suddenly God’s language changes, and when he speaks to Moses he refers to Israel not as my people but as your people. Their sin separated them from God. Our sin likewise separates us from God, from each other, really from the very persons God created us to be. He gave us commandments because he wants us to live good and right lives, but we think we know better, and this is why we live flawed and miserable lives. The third panel depicts God’s hands reaching out to his people again. This time, they are nail-scarred. The cross in the center reminds us of why they are nail-scarred. People are now reaching out to God as they turn away from sin and turn to him. The Scripture is from John 3:3, 14-15 NIV: Jesus declared, I tell you the truth, no one can see the kingdom of God unless he is born again. …The Son of Man must be lifted up, that everyone who believes in him may have eternal life. We become born-again through Jesus’s self-sacrifice: The Son of Man must be lifted up, that everyone who believes in him may have eternal life. (3:14-15) Jesus died on the cross to remove sin as a barrier between God and us. This is how he saved us, and became our saver (or Savior). The nail scars in God’s hands remind us that this sacrifice wasn’t because God is bloodthirsty or vengeful; Jesus is God, and God did what he had to do to restore us to himself. When we believe in Christ’s sacrifice on the cross (see the cross in the middle of the page) we are born-again by the Spirit of God and made new in him. We are given a second-chance and receive eternal life through an ongoing relationship of obedience to Jesus. The fourth panel shows God’s hands accepting his people, who are demonstrating love for one another. 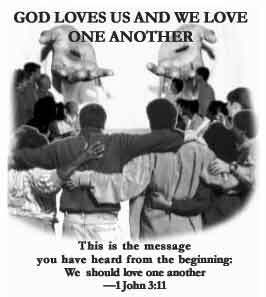 The Scripture is from 1 John 3:11 NIV: This is the message you heard from the beginning: We should love one another. This links the message of salvation with God’s plan for humanity from the very beginning. Our relationship with God, with others and with the broken selves we have become is restored so we can truly love as Jesus loved. It reminds people that Christians are to love one another as God loves us. (Jn 13:34, 15:12, 1Jn 4:11) It also suggests the need for a church, where we can best practice love for one another. God loves you and wants to share eternal life with you. 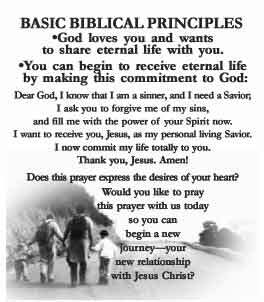 You can begin to receive eternal life by making this commitment to God. Read this prayer: Dear God, I know I am a sinner, and I need a Savior. I ask you to forgive me of my sins, and fill me with the power of your Holy Spirit now. I want to receive you, Jesus, as my personal living Savior. I now commit my life totally to you. Thank you, Jesus. Amen! If you prayed that prayer sincerely with full commitment to Christ, then heaven rejoices with you! 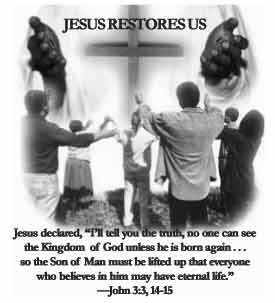 Jesus says “there is more rejoicing in heaven over one sinner that repents than 99 that don’t need to” (Lk. 15:7). Right now they are having a Hallelujah party in heaven as your name is now written down in the Lambs book of Life (Rev. 21:27). Remember: Saying the prayer is only the beginning of a new relationship with Christ. Further steps will need to be taken. 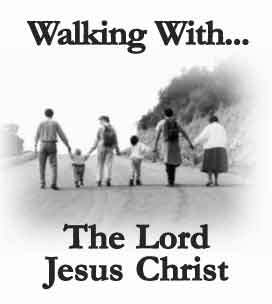 Please see the Walking with the Lord Jesus Christ pamphlet or the video of Dr. Kelly explaining this pamphlet. 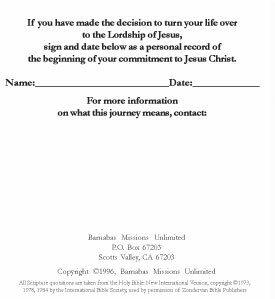 Also, on the form above you can indicate if you would like a mature Christian from your area to contact you personally to answer any questions you might have about the gospel and your new journey with the Lord Jesus. The sixth panel, or the back, is a place for the new Christians to sign and date the pamphlet, as a reminder that this person has received Christ. We will be contacting you soon to answer any questions they may have about that pamphlet.